Master regulatory genes of tissue specification play key roles in stem/progenitor cells and are often important in cancer. In the prostate, androgen receptor (AR) is a master regulator essential for development and tumorigenesis, but its specific functions in prostate stem/progenitor cells have not been elucidated. We have investigated AR function in CARNs (CAstration-Resistant Nkx3.1-expressing cells), a luminal stem/progenitor cell that functions in prostate regeneration. Using genetically--engineered mouse models and novel prostate epithelial cell lines, we find that progenitor properties of CARNs are largely unaffected by AR deletion, apart from decreased proliferation in vivo. Furthermore, AR loss suppresses tumor formation after deletion of the Pten tumor suppressor in CARNs; however, combined Pten deletion and activation of oncogenic Kras in AR-deleted CARNs result in tumors with focal neuroendocrine differentiation. Our findings show that AR modulates specific progenitor properties of CARNs, including their ability to serve as a cell of origin for prostate cancer. Most prostate tumors rely on male hormones – called androgens – to survive. Aggressive prostate cancer is often treated with drugs that block androgens, which usually cause the prostate tumors to shrink. One class of the drugs works by binding to and inactivating the androgen receptor protein on prostate cancer cells. However, aggressive prostate tumors can often become resistant to these anti-androgen therapies. It is not clear where the resistant cancer cells come from. In 2009, researchers showed that the normal prostate contains some cells that appear to be independent of androgens. A subset of these cells – also known as CARNs – can act as stem or progenitor cells that can repair the prostate after injury. These normal androgen-independent cells can also be the cells from which prostate tumors arise. Here, Chua et al. – including one of the researchers from the 2009 study – investigated how these CARN cells behave when the androgen receptor is deleted. When the androgen receptor was genetically removed in CARN cells of otherwise healthy mice, the behavior of CARN cells was unaffected. When the androgen receptor was deleted together with a protein that normally suppresses the formation of tumors, it protected the mice from prostate cancer. However, Chua et al. also observed that deleting the androgen receptor could not prevent the tumor from growing when two cancer-causing mutations were present. These tumors were similar to human prostate tumors that are resistant to anti-androgen therapy. Since CARN cells may also exist in humans, this new way of making prostate cancers in mice may be used to study how these resistances arise in patients. A better understanding of how prostate tumors develop might lead to new treatments in which the androgen receptor is blocked in combination with other new protein targets. Elucidating the cell type(s) of origin of cancer and the molecular drivers of tumor initiation is of fundamental importance in understanding the basis of distinct tumor subtypes as well as differences in treatment response and patient outcomes (Blanpain, 2013; Rycaj and Tang, 2015; Shibata and Shen, 2013; Visvader, 2011). Furthermore, since cancer often originates from stem cells and/or lineage-restricted progenitor cells, the identification of stem/progenitor cells is of considerable significance. In the case of the prostate, however, both the specific identity of stem/progenitor cells as well as cell types of origin for cancer have remained unclear (Lee and Shen, 2015; Wang and Shen, 2011; Xin, 2013). In the normal prostate epithelium, there are three primary cell types, corresponding to secretory luminal cells, an underlying layer of basal cells, and rare neuroendocrine cells (Shen and Abate-Shen, 2010; Toivanen and Shen, 2017). Lineage-tracing studies have shown that both luminal and basal cells are mostly lineage-restricted (unipotent) in the normal adult mouse prostate as well as during androgen-mediated prostate regeneration (Choi et al., 2012; Liu et al., 2011; Lu et al., 2013; Wang et al., 2013). In addition, cells within the basal compartment possess stem/progenitor properties in a range of ex vivo assays as well as during inflammation and wound repair (Goldstein et al., 2008; Höfner et al., 2015; Kwon et al., 2014; Lawson et al., 2007; Toivanen et al., 2016; Wang et al., 2013). However, recent studies have shown that luminal cells can also display stem/progenitor properties in specific in vivo and ex vivo contexts (Chua et al., 2014; Karthaus et al., 2014; Kwon et al., 2016; Wang et al., 2009). Furthermore, there is now considerable evidence supporting a luminal origin for prostate cancer, both in mouse models (Wang et al., 2009; Wang et al., 2014) as well as in human tissues (Gurel et al., 2008; Meeker et al., 2002). Androgen receptor (AR) plays a central role in many aspects of normal prostate development as well as prostate cancer progression (Cunha et al., 2004; Toivanen and Shen, 2017; Watson et al., 2015). In the prostate epithelium of adult hormonally intact mice, AR is primarily expressed by luminal cells, but is also found in a subset of basal cells (Lee et al., 2012; Mirosevich et al., 1999; Xie et al., 2017). Several studies have shown that conditional deletion of AR in the adult prostate epithelium results in a short-term increase in proliferation of luminal cells (Wu et al., 2007; Xie et al., 2017; Zhang et al., 2016a), indicating a role for AR in normal prostate homeostasis. Importantly, AR can act as a master regulator of prostate epithelial specification in a fibroblast reprogramming assay (Talos et al., 2017). In the context of prostate cancer, tumor recurrence after androgen-deprivation therapy is due to the emergence of castration-resistant prostate cancer (CRPC), which is associated with increased AR activity that can be targeted by second-generation anti-androgen therapies (Watson et al., 2015). However, treatment failure following such anti-androgen therapies is frequently associated with the appearance of AR-negative tumor cells, which are typically associated with highly aggressive lethal disease (Beltran et al., 2014; Vlachostergios et al., 2017; Watson et al., 2015). In some cases, this AR-negative CRPC contain large regions displaying a neuroendocrine phenotype (CRPC-NE) (Beltran et al., 2016, 2014; Ku et al., 2017; Mu et al., 2017; Zou et al., 2017). Previous work from our laboratory has identified CARNs as a luminal stem/progenitor cell within the androgen-deprived normal mouse prostate epithelium that is also a cell of origin for prostate cancer (Wang et al., 2009). Following androgen administration to induce prostate regeneration, CARNs can generate both luminal and basal progeny in vivo, as well as in renal grafting and organoid assays (Chua et al., 2014; Wang et al., 2009). Although CARNs express AR (Wang et al., 2009), it has been unclear whether AR is required for any or all the progenitor properties of CARNs, and whether the intrinsic castration-resistance of untransformed CARNs might resemble the castration-resistance of tumor cells in CRPC. Below, we show that the progenitor properties of CARNs are largely unaffected by loss of AR, whereas their ability to serve as cells of origin for prostate cancer are altered by AR deletion in a context-dependent manner. Notably, cell lines derived from AR-deleted CARNs have molecular profiles that resemble those for CRPC, and AR-deleted CARNs can serve as a cell of origin for focal neuroendocrine differentiation in a novel mouse model of AR-negative prostate cancer. To investigate whether the stem/progenitor properties of CARNs are dependent upon AR function, we have used an inducible targeting approach in genetically engineered mice. For this purpose, we used mice carrying a conditional allele of Ar (De Gendt et al., 2004) together with the inducible Nkx3.1CreERT2 driver (Wang et al., 2009) and the R26R-YFP reporter to visualize cells and their progeny in which Cre-mediated recombination has taken place (Srinivas et al., 2001); as Ar is an X-linked gene, deletion of a single allele in males is sufficient to confer a hemizygous null phenotype. Since CARNs are Nkx3.1-expressing cells found under androgen-deprived conditions, we castrated adult male mice carrying the Cre driver and reporter alleles, followed by tamoxifen induction to induce Cre-mediated activity specifically in CARNs (Figure 1A). CARNs remain luminal after AR deletion. (A) Time course for lineage-marking of CARNs and inducible AR deletion using castrated and tamoxifen-treated control Nkx3.1CreERT2/+; R26R-YFP/+ mice and Nkx3.1CreERT2/+; Arflox/Y; R26R-YFP/+ mice. (B) FACS analyses of lineage-marked YFP+ cells in total EpCAM+ epithelial cells. (C) Percentage of YFP+ cells among total epithelial cells in castrated and tamoxifen-induced Nkx3.1CreERT2/+; R26R-YFP/+ controls and Nkx3.1CreERT2/+; Arflox/Y; R26R-YFP/+ mice. Error bars represent one standard deviation; the difference between groups is not significant (p=0.51, independent t-test). (D) Expression of AR, luminal markers (CK8 and CK18), and basal markers (CK5 and p63) in lineage-marked CARNs (top) and AR-deleted CARNs (bottom). Note that all lineage-marked cells express luminal but not basal markers (arrows). Scale bars in D) correspond to 50 μm. Using this strategy, we compared the properties of CARNs in Nkx3.1CreERT2/+; R26R-YFP/+ mice, which we denote as ‘control’ mice, with those in Nkx3.1CreERT2/+; Arflox/Y; R26R-YFP/+ mice, which we denote as ‘AR-deleted’ mice. We found that the percentage of lineage-marked YFP-positive cells, corresponding to CARNs, was not significantly different (p=0.51) between the control (0.36 ± 0.17%, n = 5 mice) and AR-deleted mice (0.31 ± 0.06%, n = 5 mice) (Figure 1B,C). Notably, we found that 87.1% of the YFP-positive cells in Nkx3.1CreERT2/+; Arflox/Y; R26R-YFP/+ mice (n = 344/395 cells in four mice) were AR-negative, indicating that AR deletion occurred with high efficiency. Furthermore, these YFP-positive cells expressed the luminal markers cytokeratins 8 and 18 (CK8 and CK18), but not cytokeratin 5 (CK5) and p63, indicating that AR deletion does not alter the luminal phenotype of CARNs (Figure 1D). These findings indicate that AR deletion does not affect the frequency or luminal properties of CARNs. To investigate the progenitor properties of AR-deleted CARNs, we examined their ability to generate progeny during androgen-mediated regeneration. We implanted subcutaneous mini-osmotic pumps containing testosterone into control Nkx3.1CreERT2/+; R26R-YFP/+ mice as well as Nkx3.1CreERT2/+; Arflox/Y; R26R-YFP/+ mice, followed by tissue harvest at 4, 7, 14, and 28 days later; the final 28-day time point corresponds to a fully regenerated prostate (Figure 2A). We found that the YFP-marked cells and cell clusters were similar in the control and AR-deleted prostates at 4 and 7 days after testosterone administration (Figure 2B,C). However, at 14 and 28 days, the control prostates contained many YFP-expressing cell clusters with more than 4 cells, whereas the prostates with AR-deleted CARNs mostly contained YFP-expressing single cells or doublets (Figure 2B,C). AR-deleted CARNs fail to generate lineage-marked cell clusters but remain bipotential during androgen-mediated regeneration. (A) Time course for lineage-marking and androgen-mediated regeneration. (B) Percentage of single YFP+ cells or YFP+ clusters of 2 cells, 3–4 cells, and >4 cells at 4, 7, 14, and 28 days of androgen-mediated regeneration. This analysis does not include YFP+AR+ cells that fail to undergo AR deletion in the experimental mice; full quantitation of all cell populations is provided in Figure 2—source data 1. (C) YFP+ cells (arrows) in prostates of mice with lineage-marked CARNs (top) and AR-deleted CARNs (bottom) at days 4, 7, 14 and 28 days during androgen-mediated regeneration. (D) Identification of basal YFP+ cells (arrows) as progeny of CARNs (top) or AR-deleted CARNs (bottom). Scale bars in C) and D) correspond to 50 μm. To compare the proliferative ability of control and AR-deleted CARNs and their progeny, we pursued BrdU pulse-chase experiments during prostate regeneration. We performed castration and tamoxifen administration on control and AR-deleted mice, followed by androgen-mediated regeneration for 28 days, with administration of daily doses of BrdU either from days 1 through 4 of regeneration or from days 11 through 14 (Figure 3A,B). When BrdU was administered from days 1 through 4 of regeneration, we could readily detect BrdU+YFP+ cells in the control prostates (50.9 ± 11.8%, n = 3 mice) as well as AR-deleted prostates (62.9 ± 14.9%, n = 3 mice) (Figure 3C,E). In contrast, when BrdU was administered from days 11 through 14, we could only detect BrdU+YFP+ cells in the control prostates (11.1 ± 6.2%, n = 3 mice), but not in the AR-deleted prostates (0%, n = 3 mice) (Figure 3D,F). This difference suggests that AR-deleted CARNs and/or their progeny have a defect in proliferation during later stages of regeneration, consistent with the analysis of YFP+ cluster size (Figure 2B). AR-deleted CARNs and/or their progeny have defects in proliferation during regeneration and in renal grafts. (A,B) Time course of BrdU incorporation during androgen-mediated regeneration of castrated and tamoxifen-treated control Nkx3.1CreERT2/+; R26R-YFP/+ mice and Nkx3.1CreERT2/+; Arflox/Y; R26R-YFP/+ mice. BrdU injections were performed during either days 1 through 4 (A) or days 11 through 14 (B), followed by analysis at 28 days. (C) Identification of BrdU+YFP+ cells (arrows) in control (top) and AR-deleted (bottom) prostate tissue after administration of BrdU during early stages of regeneration. (D) YFP-positive cells in control prostate tumors (top) can incorporate BrdU (arrow) but not in AR-deleted prostate tumors (bottom), after administration of BrdU during later stages of regeneration. (E,F) Percentage of BrdU+ and BrdU– cells among total YFP+ cells after injection of BrdU from days 1 through 4 (E) or days 11 through 14 (F) of regeneration. Error bars represent one standard deviation; the difference in (E) is not statistically significant (p=0.34, independent t-test), but is significant in (F) (p=0.027, independent t-test). This analysis excludes YFP+AR+ cells that fail to undergo AR deletion in the experimental mice; full quantitation of all cell populations is provided in Figure 3—source data 1. (G) Schematic depiction of tissue recombination of lineage-marked CARNs with rat urogenital mesenchyme followed by renal grafting. (H) Analysis of grafts generated from lineage-marked CARNs (top) and AR-deleted CARNs (bottom); arrows in bottom panels indicate AR-expressing stromal cells surrounding the AR-negative prostate duct. Scale bars in C), D) and H) correspond to 50 μm. Notably, although YFP-expressing basal cells could be readily identified in both control and AR-deleted prostates, there was an increase in the percentage of basal cells within the YFP+ population in the AR-deleted mice (Figure 2D). This difference was evident using either the basal marker CK5 (2.1% CK5+AR+YFP+ versus 19.2% CK5+AR–YFP+) or p63 (3.5% p63+AR+YFP+ versus 14.6% p63+AR–YFP+) (Figure 2D). These findings indicate that AR-deleted CARNs favor generation of basal progeny and/or that there is decreased proliferation or survival of luminal progeny during regeneration. As a further test of the progenitor properties of AR-deleted CARNs, we examined their ability to generate prostate ducts in a tissue recombination/renal grafting assay. Previously, we had shown that single CARNs were capable of generating ducts in this assay (Wang et al., 2009). We isolated YFP-positive cells from control and AR-deleted mice that had undergone castration and tamoxifen induction, and recombined 10 YFP-positive cells together with 2.5 × 105 rat embryonic urogenital mesenchyme cells, followed by renal grafting (Figure 3G). We found that both control and AR-deleted CARNs could generate prostate ducts (Figure 3H), but that the AR-deleted CARN-s were significantly less efficient (12.5% graft efficiency, n = 16) compared to the control CARNs (p=0.003; 68.8% graft efficiency, n = 16), consistent with a proliferation defect in the AR-deleted CARNs. Based on these findings, we further investigated the properties of CARNs and AR-deleted CARNs by establishing adherent cell lines. Using a novel method based on conditions that we previously established for culture of prostate organoids (Chua et al., 2014), we successfully generated adherent cell lines from single YFP+ cells isolated from castrated and tamoxifen-treated Nkx3.1CreERT2/+; Arflox/Y; R26R-YFP/+ mice. Genotyping of the resulting lines led to identification of Ar-positive (non-recombined allele) and Ar-negative (recombined allele) lines, which we term APCA and ADCA (Ar-Positive CArn-derived and Ar-Deleted CArn-derived) lines. These cell lines could be propagated as adherent cells in the presence of Matrigel and DHT. Under these conditions, we found that the APCA (n = 2) and ADCA (n = 2) lines were morphologically indistinguishable (Figure 4A). These cell lines were comprised of a mixture of cells expressing basal (CK5) or luminal (CK8) markers or both, as well as Foxa1, an epithelial marker that encodes a transcriptional partner of AR (Gao et al., 2003; He et al., 2010) (Figure 4A). Furthermore, both the APCA and ADCA lines showed robust proliferation at similar levels, as demonstrated by Ki67 immunostaining, CellTiter-Glo assays, and colony formation in the presence or absence of DHT (Figure 4A–C). Properties of cell lines established from CARNs and AR-deleted CARNs. (A) Morphology and marker expression of cell lines derived from single YFP+ cells from castrated and tamoxifen-treated control Nkx3.1CreERT2/+; R26R-YFP/+ mice and Nkx3.1CreERT2/+; Arflox/Y; R26R-YFP/+ mice. The APCA lines (top) and ADCA lines (bottom) show similar bright-field morphology, expression of YFP, Foxa1, and Ki67, as well as co-expression of CK8 and CK5, but differ in expression of AR. (B) APCA and ADCA cell lines display similar cell growth at days 1, 2, 4, and 6 after plating in the absence or presence of DHT, as assessed by CellTiter-Glo assay. Results shown are from a single experiment with five technical replicates and are representative of two biological replicates after normalization with day 0 luminescent signal. (C) Colony formation by APCA and ADCA cell lines in the absence or presence of DHT. Results are from a single experiment with three technical replicates and are representative of two biological replicates. (D) Renal grafts generated from tissue recombinants of 100,000 APCA or ADCA cells with rat urogenital mesenchyme, and analyzed at 12 weeks. Bottom row shows APCA grafts treated with tamoxifen for 4 days at 7 weeks of growth to induce Ar deletion (bottom); arrows indicate cells that did not undergo Ar deletion after tamoxifen treatment. Scale bars in A) and D) correspond to 50 μm. To determine the relative efficiency of forming APCA and ADCA lines from AR+ and AR– CARNs, respectively, we sorted 60 single YFP+ cells from castrated and tamoxifen-treated Nkx3.1CreERT2/+; Arflox/Y; R26R-YFP/+ mice into individual wells of a 96-well plate. We found that six YFP+ cells gave rise to adherent lines, with four of these corresponding to AR+ lines that had failed to undergo Cre-mediated recombination of the conditional Ar allele, and two lines corresponding to AR– lines. After correcting for the 87.1% efficiency of recombination of the AR-floxed allele in vivo, these data indicate that the relative plating efficiency for the AR– CARNs compared to AR+ CARNs is 7.4%, consistent with the decreased grafting efficiency of AR– CARNs. Notably, we were also able to use this methodology to establish 14 primary human prostate epithelial cell lines from benign prostatectomy specimens at high efficiency. Similar to the mouse APCA cell lines, these HPE (Human Prostate Epithelial) cell lines are propagated as adherent cells in the presence of Matrigel and DHT. All these lines display similar marker phenotypes, expressing basal and luminal markers as well as AR and PSA, and are highly proliferative (Figure 4—figure supplement 1). 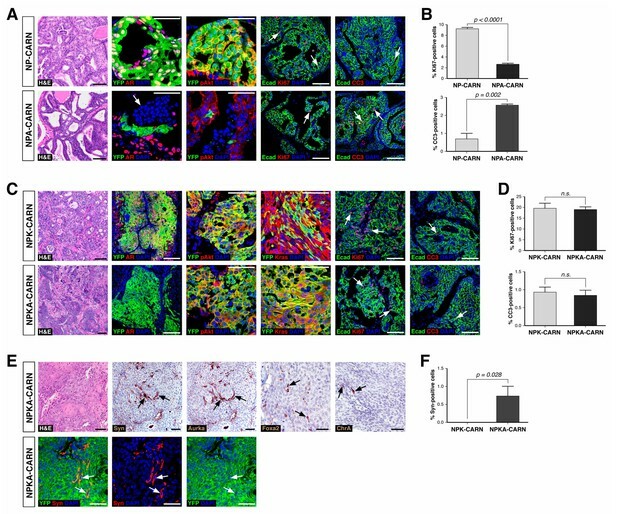 To assess the ability of the APCA and ADCA cell lines to reconstitute prostate ducts, we performed tissue recombination assays by combining 1 × 105 cells with rat urogenital mesenchyme followed by renal grafting. We found that the APCA lines could generate prostate ducts (n = 10 grafts with two lines; 100% efficiency), some with evidence of secretions, whereas the ADCA lines (n = 6 grafts with one line; 67% efficiency) generated ducts that lacked prostate secretions (Figure 4D). Next, we tested the role of AR in this tissue reconstitution assay by treating the mice grafted with APCA cells (n = 12 grafts with two lines) with tamoxifen at 7 weeks after grafting in order to induce Ar deletion. We found that tamoxifen treatment resulted in grafts containing prostate ducts composed of a mixture of AR-positive and negative cells, but with a decreased efficiency of graft formation relative to the same APCA lines in the absence of tamoxifen (42% versus 100% efficiency) (Figure 4D). Taken together, these results show that AR deletion decreases the efficiency of prostate duct formation by CARN-derived cells, consistent with the results obtained using AR-deleted CARNs (Figure 3H). Notably, since ADCA cells do not display a growth disadvantage relative to APCA cells in culture, this difference in duct formation is likely to be due to a non-cell-autonomous effect mediated by the urogenital mesenchyme in grafts. To examine the molecular basis for differences between the ADCA and APCA lines (n = 2 lines each), we performed RNA-sequencing followed by bioinformatic analyses. Based on the RNA expression profiling data, we constructed a differential expression signature comparing ADCA cells to APCA cells. Using the resulting ADCA signature to examine pathway enrichment by Gene Set Enrichment Analysis (GSEA) (Subramanian et al., 2005), we found up-regulation of gene sets involved in DNA replication and repair pathways, as well as cell cycle and apoptosis (Figure 5A), suggesting that cellular proliferation and survival are affected by AR deletion. We also compared the ADCA signature with a signature defined between expression profiles of AR-null and AR-positive mouse prostate luminal cells (Xie et al., 2017) and found enrichment for up-regulated genes (Figure 5B). 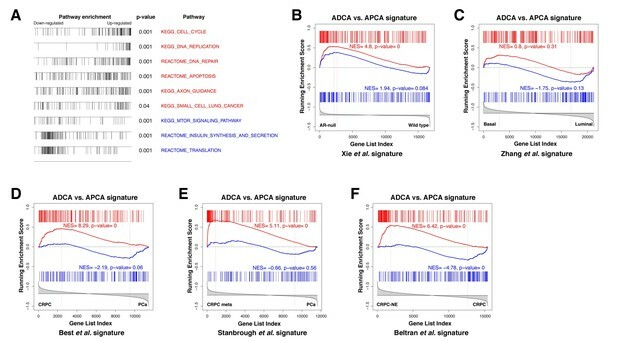 Next, we performed a cross-species comparison of the ADCA signature with a signature defined between profiles of human prostate luminal and basal epithelial cells (Zhang et al., 2016b) and found that there was no significant enrichment in either tail (Figure 5C), indicating that AR deletion does not drive APCA cells towards a specific lineage. Furthermore, we performed GSEA comparisons of the ADCA signature with several signatures obtained from analyses of human prostate cancer progression. In particular, we observed enrichment for up-regulated genes when compared to a signature of CRPC from Best and colleagues (Best et al., 2005), as well as to a signature of metastatic CRPC from Stanbrough and colleagues (Stanbrough et al., 2006) (Figure 5D,E). Moreover, we observed a strong enrichment when compared to a signature from Beltran and colleagues (Beltran et al., 2016) defined between CRPC with neuroendocrine differentiation (CRPC-NE) and non-neuroendocrine CRPC (Figure 5F), consistent with our observation of pathway enrichment for gene sets corresponding to axon guidance and small-cell lung cancer (Figure 5A). 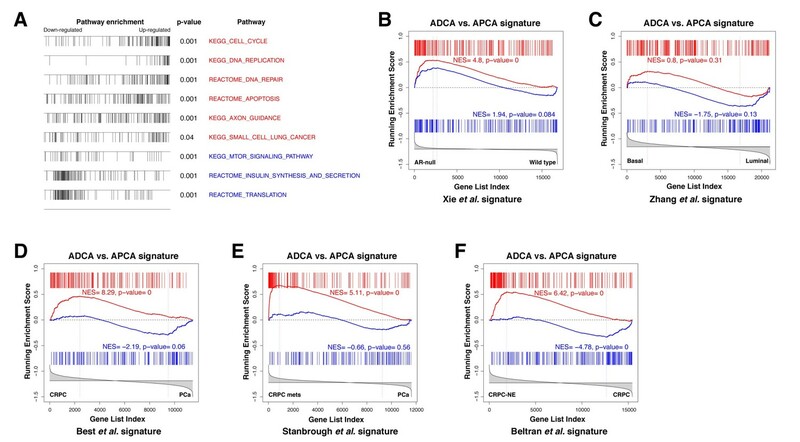 Gene set enrichment analysis of the ADCA signature. (A) Selected biological pathways that are enriched in the ADCA versus APCA signature. (B) GSEA plot showing enrichment in the positive tail for a signature of AR-null mouse prostate epithelial cells. (C) Cross-species GSEA showing lack of enrichment with a signature based on isolated human prostate basal and luminal epithelial populations. (D–F) Cross-species GSEA comparing the ADCA expression signature with three independent expression signatures based on tumor samples from human patients. NES: normalized enrichment score; p-value is calculated using 1000 gene permutations. Finally, we tested the ability of AR-deleted CARNs to serve as a cell of origin for prostate cancer, based on the previous finding that prostate cancer can initiate from CARNs after specific deletion of Pten and androgen-mediated regeneration (Wang et al., 2009). We used Nkx3.1CreERT2/+; Ptenflox/flox; R26R-YFP/+ controls (which we term NP-CARN) and Nkx3.1CreERT2/+; Ptenflox/flox; Arflox/Y; R26R-YFP/+ mice (NPA-CARN) in an experimental paradigm involving castration, tamoxifen-treatment, and androgen-mediated regeneration for one month. We found that AR deletion resulted in a significant difference between the NP-CARN and NPA-CARN phenotypes, as the NP-CARN controls displayed high-grade prostatic intraepithelial neoplasia (PIN), whereas the NPA-CARN prostates showed a weak phenotype corresponding to diffuse hyperplasia with mild inflammation and increased apoptosis, (Figure 6A). The NPA-CARN prostates contained YFP-positive cells that also expressed phospho-Akt (pAkt), indicating successful deletion of Pten, but these cells were only found as solitary or as small clusters, unlike the large clusters of YFP+pAkt+ cells observed in the control NP prostates (Figure 6A). Furthermore, the NPA-CARN prostates displayed a decreased proliferative index relative to NP-CARN (2.7%, n = 3 vs. 9.2%, n = 3), as well as increased apoptosis (2.6%, n = 3 vs. 0.7%, n = 3) (Figure 6B). Taken together, findings indicate that AR is required for tumor initiation following Pten deletion in CARNs. Deletion of AR alters the ability of CARNs to serve as a cell of origin for prostate cancer. (A) Prostate histology and marker expression in Nkx3.1CreERT2/+; Ptenflox/flox; R26R-YFP/+ (NP-CARN) and Nkx3.1CreERT2/+; Ptenflox/flox; Arflox/Y; R26R-YFP/+ (NPA-CARN) mice that have been castrated and tamoxifen-treated, followed by androgen-mediated regeneration for 1 month. Shown are representative images for hematoxylin-eosin staining (H and E) and immunofluorescence for YFP, AR, phospho-Akt (pAkt), E-cadherin (Ecad), Ki67, and cleaved caspase-3 (CC3). Arrows indicate occurrence of cell death (YFP/AR in NPA-CARN), proliferation (Ecad/Ki67), and apoptosis (Ecad/CC3). (B) Quantitation of Ki67+ and CC3+-positive cells in total Ecad+ epithelial cells in NP-CARN and NPA-CARN prostates. Error bars represent one standard deviation; differences between groups are statistically significant as determined by independent t-test. (C) Prostate tumor histology and marker expression in Nkx3.1CreERT2/+; Ptenflox/flox; KrasLSL-G12D/+; R26R-YFP/+ (NPK-CARN) and Nkx3.1CreERT2/+; Ptenflox/flox; KrasLSL-G12D/+; Arflox/Y; R26R-YFP/+ (NPKA-CARN) mice that have been castrated and tamoxifen-treated, followed by androgen-mediated regeneration for 1 month. Arrows indicate cells undergoing proliferation (Ecad/Ki67) and apoptosis (Ecad/CC3). (D) Quantitation of Ki67+ and CC3+-positive cells in total Ecad+ epithelial cells in NPK-CARN and NPKA-CARN prostates. Differences between groups are not statistically significant as determined by independent t-test (Ki67, p=0.724; CC3, p=0.507). (E) Focal neuroendocrine differentiation in NPKA-CARN tumors. Shown are H and E and immunohistochemical staining (IHC) of serial sections for Synaptophysin (Syn) and Aurora kinase A (Aurka), IHC for Foxa2 and Chromogranin A (ChrA), as well as immunofluorescence for YFP and Syn shown as an overlay and as individual channels; arrows indicate positive cells. (F) Quantitation of Syn+ cells in total epithelial cells in NPK-CARN and NPKA-CARN tumors. Scale bars for H and E and IHC in A, C,) and E) correspond to 100 μm, and in other panels to 50 μm. In contrast, AR deletion did not affect tumor initiation following combined deletion of Pten and activation of the oncogenic KrasG12D allele. Using a similar protocol for castration, tamoxifen-treatment, and androgen-mediated regeneration, we compared the phenotypes of Nkx3.1CreERT2/+; Ptenflox/flox; KrasLSL-G12D/+; R26R-YFP/+ controls (NPK-CARN) and Nkx3.1CreERT2/+; Ptenflox/flox; KrasLSL-G12D/+; Arflox/Y; R26R-YFP/+ mice (NPKA-CARN). In both genotypes, deletion of Pten and activation of oncogenic Kras resulted in formation of tumors with large clusters of YFP+ cells that express pAkt and Ras (Figure 6C). Furthermore, both NPK-CARN and NPKA-CARN tumors displayed high proliferative indices (20%, n = 3 vs. 19%, n = 3) and low frequencies of apoptosis (0.9%, n = 3 vs. 0.8%, n = 3) (Figure 6D). Notably, we observed an important difference between the NPK-CARN and NPKA-CARN tumors, as all the NPKA-CARN tumors contained a low but variable percentage of synaptophysin-positive neuroendocrine cells among total epithelial cells (0.7%, n = 3), which were never observed in the NPK-CARN controls (0%, n = 3) (Figure 6E,F). We also observed rare cells in all three NPKA-CARN tumors that expressed other neuroendocrine markers such as Chromogranin A, Foxa2, and Aurora kinase A (Figure 6E). Since the synaptophysin-postive cells co-expressed YFP (Figure 6E), we conclude that transformed AR-negative CARNs can give rise to neuroendocrine cells. Taken together, our analyses have defined specific roles for AR in regulating the progenitor properties of CARNs, and indicate that the intrinsic castration-resistance of CARNs is independent of AR function. We find that targeted deletion of AR does not affect the percentage of CARNs, their luminal marker expression, or their ability to generate basal cells during androgen-mediated regeneration. 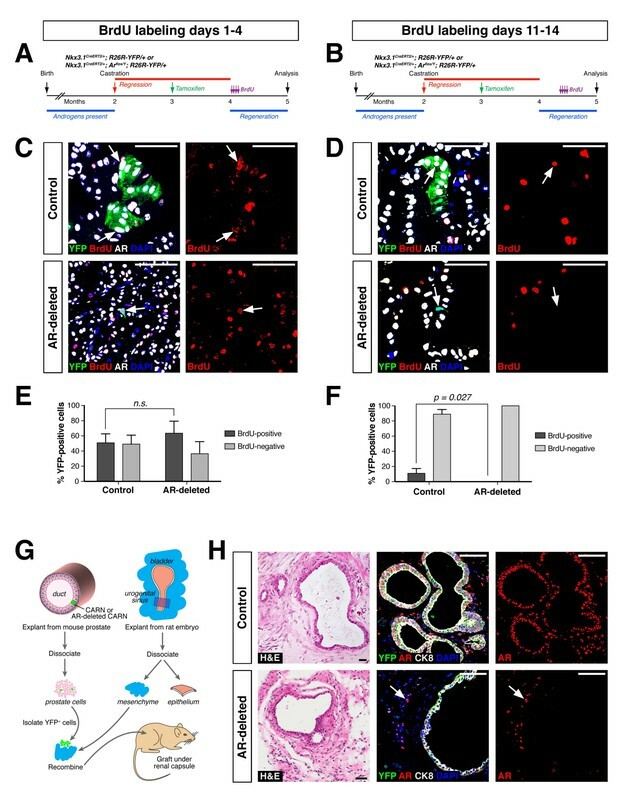 However, there are fewer luminal progeny from AR-deleted CARNs during regeneration in vivo, and there is a decreased efficiency of prostate duct formation by both AR-deleted CARNs and ADCA cells in renal grafts. Thus, AR deletion in CARNs may primarily affect the proliferation and/or survival of their luminal progeny in vivo, although an effect on CARNs themselves cannot be excluded. Interestingly, our results suggest potential roles of the stroma in modulating the proliferation of CARNs and/or their luminal progeny. Notably, BrdU incorporation assays reveal a proliferation defect of AR-deleted CARNs during later stages of regeneration but not during early regeneration. One possible explanation is that AR activity may cell-autonomously regulate the proliferation of luminal progeny of CARNs; alternatively, however, stromal remodeling during later stages of regeneration may alter non-cell autonomous signals that regulate luminal proliferation. 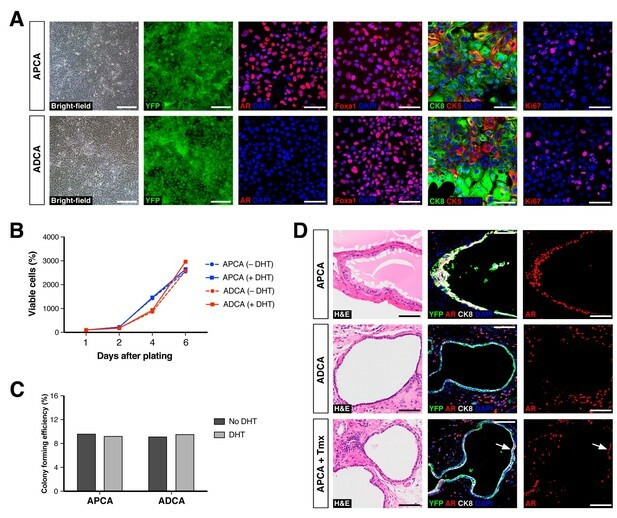 Furthermore, since ADCA cells do not display a growth defect in culture, their decreased efficiency of prostate duct formation in grafts is likely due to a non-cell-autonomous inhibitory effect from the stroma. Our study has also yielded interesting insights into differences between CARNs and other luminal epithelial cells. While this manuscript was in preparation, another study also investigated the requirements of AR in CARNs, and reported that AR-deleted CARNs completely failed to generate progeny during regeneration (Xie et al., 2017). This apparent discrepancy may be partially explained by our observation that AR-deleted CARNs can still generate basal progeny, and by the failure of progeny from AR-deleted CARNs to proliferate at later stages of androgen-mediated regeneration. However, we concur that CARNs require AR function to generate viable luminal progeny, which is not the case for most luminal cells during homeostasis or regeneration (Xie et al., 2017; Zhang et al., 2016a). Furthermore, the decreased proliferation of AR-deleted CARNs during regeneration contrasts with the transient increase in luminal proliferation observed after inducible AR deletion in the adult prostate epithelium, which is also a non-cell-autonomous effect mediated by the stroma (Zhang et al., 2016a). Together with our previous finding that CARNs display increased organoid formation efficiency relative to other luminal cells (Chua et al., 2014), these findings support the identification of CARNs as a distinct luminal population with stem/progenitor properties, and highlight the complexity of AR functions in the epithelial and stromal compartments. In addition, we note that Xie and colleagues reported that Pten deletion in CARNs resulted in tumor formation after regeneration (Xie et al., 2017), unlike the absence of tumors that we observe in NPA-CARN mice. At present, the basis for this discrepancy remains unclear. Our finding that AR deletion results in failure of tumor formation following Pten inactivation could be due to differences between CARNs and bulk luminal cells and/or to differences due to Pten loss in the regressed versus hormonally intact prostate epithelium. In principle, these possibilities could potentially be distinguished using inducible Cre-drivers to delete Pten in bulk luminal cells in regressed versus hormonally intact mice. Our findings on CARNs in mouse models may be of potential relevance for human prostate biology and cancer. Although CARNs are defined in the regressed prostate epithelium, and our in vivo studies involve manipulations performed after castration in mice, there is evidence that CARN-like cells exist in the human prostate from tissue-slice culture experiments (Zhao et al., 2010), as well as from analyses of prostate tumors after androgen-deprivation (Germann et al., 2012). However, it is less clear whether multipotent luminal progenitors can be identified in the context of the hormonally intact human prostate. Previous lineage-reconstruction studies using patterns of mitochondrial DNA mutations have indicated the existence of multipotent epithelial progenitors (Blackwood et al., 2011; Gaisa et al., 2011), and recent work has provided evidence for multipotent basal progenitors localized to the most proximal region of the prostate as well as more distally located unipotent luminal progenitors (Moad et al., 2017). 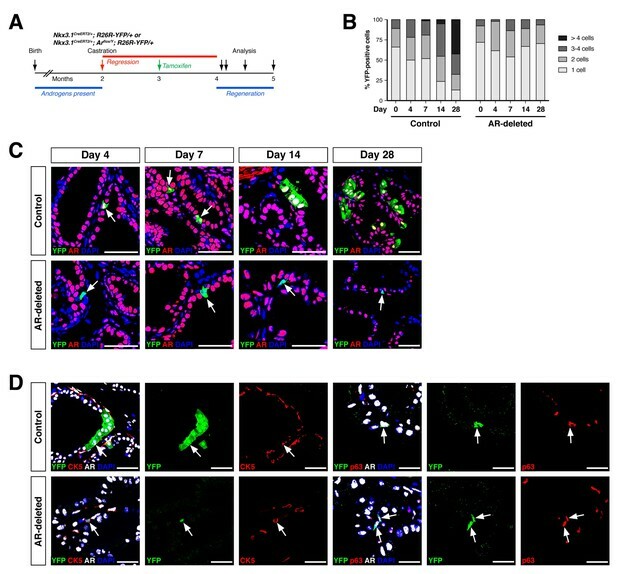 Notably, ex vivo studies of human prostate organoids have demonstrated the existence of bipotential luminal progenitors (Karthaus et al., 2014). Thus, we believe that current data favor a general similarity of epithelial lineage relationships in the two species, suggesting that findings deduced from analyses of mice may be translatable to the human prostate. The ability of CARNs to retain progenitor properties even in the absence of AR raises the possibility that CARNs represent a cell of origin for prostate cancers that are particularly susceptible to develop castration-resistance. Notably, under conditions of AR down-regulation, such as those that may occur during aging or inflammation, CARNs that lack tumor suppressors such as PTEN may represent a latent target for subsequent oncogenic events that can confer tumor growth, such as those activating the ERK MAP kinase pathway. Interestingly, our bioinformatic analyses of the ADCA cell line signature shows enrichment with castration-resistance signatures based on expression data from human prostate cancer patients (Best and Stanbrough signatures), consistent with increasing evidence supporting AR-independent mechanisms of castration-resistance (Beltran et al., 2014; Vlachostergios et al., 2017; Watson et al., 2015). In addition, the observed enrichment with the Beltran CRPC-NE signature suggests a similarity in gene expression programs with advanced cancers that lack AR activity, as neuroendocrine differentiation in prostate tumors is associated with loss of AR expression (Beltran et al., 2011). Notably, consistent with a role for AR loss in the emergence of neuroendocrine phenotypes, tumors in NPKA-CARN mice can display focal neuroendocrine differentiation, which has also been recently described in other mouse models of advanced prostate cancer (Ku et al., 2017; Zou et al., 2017). In this regard, we note that the NP-CARN and NPK-CARN mice develop tumor phenotypes similar to those in NP and NPK mice, which have the same genotypes but whose tumors are induced by the Nkx3.1CreERT2 driver in hormonally intact adult prostate (Aytes et al., 2013; Floc'h et al., 2012). Interestingly, NP tumors are initially castration-sensitive (Floc'h et al., 2012), consistent with the inability of NPA-CARN mice to develop tumors, whereas NPK tumors are castration-resistant (Aytes et al., 2013), consistent with the phenotype of NPKA-CARN tumors. The molecular basis for this switch is currently unclear, but it is conceivable that it involves ETS family transcription factors, which are known to interact with AR to positively and negatively modulate its activity (Baena et al., 2013; Bose et al., 2017; Chen et al., 2013); interestingly, ETV4 is up-regulated in NPK tumors and may be involved in this switch (Aytes et al., 2013). However, the focal neuroendocrine differentiation observed in NPKA-CARN tumors suggests that oncogenic transformation of AR-deleted CARNs can also facilitate transdifferentiation of luminal cells to neuroendocrine fates, as we have demonstrated for a Pten and Trp53 mutant mouse model (NPp53) after anti-androgen treatment (Zou et al., 2017). Finally, since tumors initiated from CARNs following combined Pten deletion and Kras activation are at least partially independent of AR from their outset, it is conceivable that such tumors are intrinsically more resistant to second-generation anti-androgen therapies. Interestingly, recent studies have also identified distinct castration-resistant progenitors that express Bmi1 (CARBs) that are cells of origin for prostate cancer (Yoo et al., 2016). The development of targeted therapies directed at molecular features of CARNs and/or other castration-resistant luminal cells may therefore be relevant for successful combination with anti-androgen therapies. The Nkx3.1CreERT2 driver (Nkx3-1tm4(cre/ERT2)Mms) has been previously described (Wang et al., 2009). Mice carrying the R26R-YFP (B6.129 × 1-Gt(ROSA)26Sortm1(EYFP)Cos/J) reporter (Srinivas et al., 2001) were obtained from the Jackson Laboratory Induced Mutant Resource. Mice carrying the conditional Ptenflox (B6.129S4-Ptentm1Hwu/J) allele (Lesche et al., 2002) and the inducible Kraslsl-G12D (B6.129-Krastm4Tyj/Nci) allele (Jackson et al., 2001) were obtained from the National Cancer Institute Mouse Models of Human Cancer Consortium Repository. Mice with the conditional Arflox (B6N.129-Artm1Verh/Cnrm) allele (De Gendt et al., 2004) was obtained from the European Mouse Mutant Archive. Animals were maintained on a congenic C57BL/6N background. Genotyping was performed using the primers listed in Supplementary file 1A. Primer sequences used for genotyping of Ar alleles were previously described (Yeh et al., 2003). For lineage-marking and simultaneous deletion of AR in CARNs, Nkx3.1CreERT2/+; Arflox/Y; R26R-YFP/+ males were castrated at 8 weeks of age and allowed to regress for 4 weeks, followed by administration of tamoxifen (Sigma; 9 mg/40 g body weight in corn oil) by daily oral gavage for four consecutive days, and a chase period of 4 weeks. Administration of testosterone for prostate regeneration (Sigma; 25 mg/ml in 100% ethanol and diluted in PEG-400 to a final concentration of 7.5 mg/ml) was performed by subcutaneous implantation of mini-osmotic pumps (Alzet) that release testosterone solution at a rate of 1.875 μg/hr, which yields physiological levels of serum testosterone (Banach-Petrosky et al., 2007). For BrdU incorporation experiments, BrdU (Sigma; 100 mg/kg) was administered by intraperitoneal injection twice daily for 4 consecutive days, either from days 1 through 4 or from days 11 through 14 during androgen-mediated regeneration. For cell of origin experiments, Nkx3.1CreERT2/+; Ptenflox/flox; Arflox/Y; R26R-YFP/+ and Nkx3.1CreERT2/+; Ptenflox/flox; KrasLSL-G12D/+; Arflox/Y; R26R-YFP/+ mice as well as corresponding controls were castrated at 8 to 12 weeks of age. One month later, mice were administered tamoxifen, with a chase period of 3 months, followed by androgen-mediated regeneration for 1 month; mice were then euthanized for analysis. All animal experiments were performed according to protocols approved by the Institutional Animal Care and Use Committee at Columbia University Medical Center. Radical prostatectomy samples were obtained from consented patients under the auspices of an Institutional Review Board approved protocol at Columbia University Medical Center. Tissue from benign prostate regions was dissected and transported to the laboratory in DMEM/F12 (Gibco) supplemented with 5% FBS. Benign pathology was first determined by H and E-staining of snap-frozen sections, and subsequently confirmed by immunostaining of paraffin sections for p63 and AMACR. Tissue dissociation and isolation were performed as previously described (Chua et al., 2014). In brief, mouse prostate tissue from all lobes was dissected in cold phosphate buffered saline (PBS) and minced with scissors. For human prostate specimens, tissue was cut into small pieces with scalpels, washed with PBS with 4 mg/ml Gentamicin (Gibco), and then minced with scissors. Both mouse and human prostate tissues were then incubated in DMEM/F12 (Gibco) supplemented with 5% FBS and 1:10 dilution of collagenase/hyaluronidase (STEMCELL Technologies) at 37°C for 3 hr. Dissociated tissues were spun at 350 g for 5 min, and resuspended in ice-cold 0.25% trypsin-EDTA (STEMCELL Technologies), followed by incubation at 4°C for 1 hr. Trypsinization was stopped by addition of Modified Hank’s Balanced Salt Solution (HBSS) (STEMCELL Technologies) supplemented with 2% FBS. After centrifugation at 350 g, pelleted cells were resuspended with pre-warmed 5 mg/ml dispase (STEMCELL Technologies) supplemented with 1:10 dilution of 1 mg/ml DNase I (STEMCELL Technologies), triturated vigorously for 1 to 2 min, and diluted by addition of HBSS/2% FBS. Finally, the cell suspension was passed through a 40 μm cell strainer (Falcon). For flow sorting of mouse prostate epithelial cells, cell suspensions were stained on ice for 25 min with fluorescent-tagged EpCAM (BioLegend #118214) antibody. For isolation of human prostate epithelial cells, we used fluorescent-tagged EpCAM (BioLegend #324208, specific for human) and E-cadherin (eBioscience #46-3249-82) antibodies. The stained cells were spun, and cell pellets washed with HBSS/2% FBS, followed by resuspension in HBSS/2% FBS with 10 µM Y-27632 (ROCK inhibitor; STEMCELL Technologies) and a 1:1000 dilution of 0.5 mg/ml DAPI to exclude dead cells. Both side-scatter pulse width (SSC-W) vs. area (SSC-A) and forward side-scatter pulse area (FSC-A) vs. heights (FSC-H) were used to isolate single dissociated cells. To establish cell lines from lineage-marked CARNs as well as benign prostate epithelial cells, we performed adherent culture in our prostate organoid medium (Chua et al., 2014), consisting of hepatocyte medium supplemented with 10 ng/ml epidermal growth factor (EGF) (Corning), 10 μM Y-27632 (STEMCELL Technologies), 1x glutamax (Gibco), 5% Matrigel (Corning), 5% charcoal-stripped FBS (Gibco) heat-inactivated at 55°C for 1 hr, and supplemented with either 100 nM or 1 nM DHT (Sigma) for mouse and human cells, respectively. To derive APCA and ADCA lines, single YFP+ cells from castrated and tamoxifen-treated Nkx3.1CreERT2/+; Arflox/Y; R26R-YFP/+ mice were flow-sorted directly into 96-well Primaria plates (Corning), and were monitored daily to assess colony formation. Successful colonies were expanded and genotyped to assess the status of the Arflox allele. For derivation of lines from benign human prostate epithelium, cells expressing either EpCAM and/or E-cadherin were plated into six-well Primaria plates at a density of 100,000 cells/well. Passaging of adherent cultures was performed by removal of accumulated Matrigel on surface of the cells by gentle washing. The cells were washed with cold PBS, treated with 0.25% trypsin for 5 min at 37°C, and mechanically dissociated. Medium was changed every 4 days. Adherent cells were frozen in media consisting of 80% FBS, 10% complete medium, and 10% DMSO. Each APCA and ADCA line has been propagated continuously for at least eight passages. To assess cell viability, APCA and ADCA lines were plated in 96-well Primaria plates at a density of 1000 cells/well in the presence or absence of DHT. Cell viability was assayed at days 1, 2, 4 and 6 after plating using CellTiter-Glo 3D (Promega), with five technical replicates for each time point. In brief, CellTiter-Glo 3D reagent was thawed at 4°C and brought to room temperature prior to use. 100 μl of the reagent was added into each well containing 100 μl of medium. After shaking for 5–10 min, the mixture was then transferred to a 96-well CELLSTAR plate (Greiner), followed by incubation at room temperature for 10 min prior to measurement using a luminometer plate reader. To assess colony formation, APCA and ADCA lines were plated in six-well Primaria plates at a density of 500 cells/well and grown for 9 days. three technical replicates were performed for each line in the presence or absence of DHT. At day 10 after plating, wells were washed with PBS and fixed with 100% methanol for 5 min. The wells were then washed with PBS for three times before staining with filtered 0.1% crystal violet solution. After drying the plates, colonies were counted, with a colony defined as a cell cluster containing at least 50 cells. For tissue recombination, 10 YFP+ cells from castrated and tamoxifen-treated Nkx3.1CreERT2/+; Arflox/Y; R26R-YFP/+ mice or control Nkx3.1CreERT2/+; R26R-YFP/+ mice were combined with 250,000 dissociated rat urogenital mesenchyme cells from embryonic day 18.5 embryos, and resuspended in 15 μl of 9:1 collagen:setting buffer solution (10x Earle’s Balanced Salt Solution (Life Technologies), 0.2 M NaHCO3, and 50 mM NaOH). The recombinants were cultured overnight in DMEM with 10% FBS and 100 nM DHT, followed by grafting under the kidney capsules of male NOD.Cg-Prkdcscid Il2rgtm1Sug/JicTac (NOG) mice (Taconic). Renal grafts were harvested for analysis at 7–12 weeks after grafting. For the experiment involving APCA and ADCA lines, 100,000 cells were recombined with 250,000 rat urogenital mesenchyme cells, followed by grafting. At 6 weeks after grafting, some mice implanted with APCA cells were treated with tamoxifen to induce Ar deletion. Grafts were harvested for analysis after 12 weeks of growth and analyzed in paraffin sections for the presence of ducts expressing YFP. (Note that ducts can also be formed by YFP–cells that are derived from contaminating rat urogenital epithelium due to incomplete separation from the urogenital mesenchyme.) Graft efficiency was calculated on the basis of the presence of YFP+ ducts in the grafts using control CARNs and on the presence of YFP+AR– ducts in the grafts using AR-deleted CARNs. For cryosections, tissues were fixed in 4% paraformaldehyde in PBS at 4°C overnight, placed in 30% sucrose in PBS overnight, and transferred to 1:1 30% sucrose in PBS and OCT (Tissue-Tek) solution for at least 4 hr prior to embedding in OCT. For paraffin sections, tissues were fixed in 10% formalin for 1 to 2 days, depending on size of tissue, prior to processing and embedding. Hematoxylin-eosin staining was performed using standard protocols. For immunostaining, sections underwent antigen-retrieval by heating in citrate acid-based or tris-based antigen unmasking solution (Vector Labs) for 45 min. Primary antibodies were applied to sections and incubated at 4°C overnight in a humidified chamber. Alexa Fluors (Life Technologies) were used as secondary antibodies. In some cases, tyramide amplification (Life Technologies) or ABC Elite (Vector Labs) kits together with HRP-conjugated or biotinylated secondary antibodies and NovaRed kit were used for signal detection. For immunofluorescent staining of cells, 5000 adherent cells/well were seeded on a eight-well Lab-Tek Chamber Slide (Nunc), grown for 4–8 days, and fixed with 4% paraformaldehyde for 10 min. After washing the slides with 3 changes of PBS, immunostaining was performed as above without antigen retrieval. Details of antibodies used are provided in Supplementary file 1B. Histological grading of mouse prostate phenotypes was performed according to (Park et al., 2002). For lineage-tracing experiments, quantitation of marker staining was performed by manual counting of cells from confocal images taken with a 40x objective. For RNA preparation, APCA and ADCA cell lines at passage 5 or 6 were grown to approximately 70–80% confluency in Primaria 6-well plates in the presence of DHT, and lysed in Trizol. Total RNA extraction was performed using the ‘No Spin’ method of the MagMAX-96 for Microarrays kit (Ambion). Library preparation and RNA sequencing was performed by the Columbia Genome Center using their standard pipeline. In brief, mRNA was enriched by poly-A pull-down, and library preparation was performed using an Illumina TruSeq RNA prep kit. Libraries were pooled and sequenced using an Illumina HiSeq2500 instrument, yielding approximately 30 million single-ended 100 bp reads per sample. RTA (Illumina) was used for base calling and bcl2fastq2 (version 2.17) for conversion of BCL to fastq format, coupled with adaptor trimming. Reads were mapped to the mouse genome (UCSC/mm10) using STAR (2.5.2b) and FeatureCounts (v1.5.0-p3). RNA-seq data raw counts were normalized and the variance was stabilized using DESeq2 package (Bioconductor) in R-studio 0.99.902, R v3.3.0 (The R Foundation for Statistical Computing, ISBN 3-900051-07-0). Differential gene expression signatures were defined as a list of genes ranked by their differential expression between any two phenotypes of interest (e.g. APCA versus ADCA lines; CRPC-NE versus CRPC, etc. ), estimated using a two-sample two-tailed Welch t-test (for n ≥ 3) or fold-change (for n < 3). For comparison of a mouse gene signature with a human gene signature, mouse genes were mapped to their corresponding human orthologs based on the homoloGene database (NCBI). Signatures were compared using Gene Set Enrichment Analysis (GSEA) (Subramanian et al., 2005), with the significance of enrichment estimated using 1000 gene permutations. Pathway enrichment analysis was performed using the C2 database, which includes pathways from REACTOME (Fabregat et al., 2016), KEGG (Ogata et al., 1999), and BioCarta (http://www.biocarta.com/genes/allpathways.asp). Expression data are deposited in the Gene Expression Omnibus database under GSE99233. Statistical analysis was performed using the Statistical Package for the Social Sciences (SPSS). Data distribution was assessed by the Kolmogorov-Smirnov test. Arcsine transformation was performed on data with non-normal distribution. Two-sample two-tail Welch t-test or Fisher’s Exact Test was performed for comparison between two independent groups as appropriate. No statistical methods were used to pre-determine sample size, and experiments were not randomized; investigators were not blinded to allocation during experiments and outcome assessment. The Journal of Pathology 225:181–188. The Journal of Steroid Biochemistry and Molecular Biology 92:221–236. The Journal of Pathology 225:172–180. Current Opinion in Cell Biology 37:35–41. The American Journal of Pathology 182:975–991. The American Journal of Pathology 161:727–735. The Journal of Experimental Medicine 198:1899–1908. The American Journal of Pathology 177:229–239. Thank you for submitting your article "Differential requirements of androgen receptor in luminal progenitors during prostate regeneration and tumor initiation" for consideration by eLife. Your article has been reviewed by three peer reviewers, and the evaluation has been overseen by Sean Morrison as the Senior and Reviewing Editor. The reviewers have opted to remain anonymous. Androgen receptor is a major regulator essential for prostate development and prostate cancer progression, but its specific roles in prostate stem/progenitor cells are not fully clarified. By using a previous established CARNs mouse model, the current study investigated AR functions in luminal prostate progenitor cells. Although deletion of AR did not affect the progenitor properties of CARNs, loss of AR suppressed tumor formation from PTEN-deleted CARNs. Paradoxically, however, loss of AR promoted tumor aggressiveness in a PTEN-/-Kras+/+ model. Overall, the studies are very well designed and the data are solid. Together, the findings imply that AR may modulate luminal progenitor cells properties including their ability to serve as a cell of origin of prostate cancer. 1) One major limitation in the study of CARN's is that they can only be defined in the castrated mouse. One cannot label the luminal cell that will survive castration and become the CARN without castration. Thus, all labeling as well as activation of tumorigenic events is done in the castrated state. This is caveat should be explicitly noted in the paper. 2) Comparing this work with other recent work, one important question is whether and how CARN's are different from bulk luminal cells. AR deletion in bulk luminal cells, whether using Pb-Cre4 or Nkx3-1-CreERT2 in the non-castrated state does not decrease the ability to regress and regenerate or decrease Pten-loss mediated tumorigenesis (Xie, 2017). However, AR deletion in CARN's seems to be a detriment to regeneration and to Pten-loss mediated tumorigenesis. As noted above though, is the difference due to a different luminal cell (CARN vs. bulk) or Pten deletion in the castrated vs. intact state? This question could be answered using a luminal CreERT2 (CK8 or CK18) in castrated or intact mice during tamoxifen injection to delete Pten. If the authors have these mice it would be very helpful to address this. If not, they should discuss this issue. 3) What is the relative efficiency between AR+ and AR- CARN's in establishing 2D cultures? The authors used AR-floxed mice and compared clones that per chance were AR-deleted vs. intact. 4) The data demonstrating that AR depletion in PTEN/KRAS results in aggressive NE tumors is not convincing. The data describing "the important difference between the NPK-CARN and NPKA-CARN tumors" is weak and based on "NPKA-CARN tumors contained a low percentage of synaptophysin-positive neuroendocrine cells among total epithelial cells (0.7%, n=3), which was not observed in the NPK-CARN controls (0%, n=3) (Figure 6E, F). Since these neuroendocrine cells express YFP (Figure 6E), we conclude that transformed AR-negative CARNs can give rise to neuroendocrine cells". The authors need to do more than this to show focal NE lesions. At least 3 NE markers should be used and the incidence presented more frankly. Being as low as 0.7%, these cells were difficult to detect…did all 3 mice have focal NE lesions? The error bars in Figure 6 are large and suggest that maybe not all mice showed detectable lesions. This is important to know. If this is to be heralded as a new model, a more thorough presentation of the pathology is required/essential. There is no data in the paper that show these tumors were more aggressive and the authors should tone down the claim "that AR down-regulation primes CARNs to serve as a cell of origin for aggressive CRPC with focal neuroendocrine differentiation". The differentiation of NE cells in prostate tumors is a very hot topic and very confusing right now. It would not be helpful to add to the confusion. 5) The Introduction focuses entirely on murine prostate stem and progenitor cells with no discussion of the similarities and, importantly, the differences relative to human prostate stem and progenitors. This is problematic in that the authors switch over to the relevance of the issues raised in the present experiments to human prostate cancer, CRPC, and lineage switching to the neuroendocrine phenotype. While unipotent progenitors have been shown in the murine models for basal and luminal progenitors, lineage tracing in human prostate identifies a common precursor for basal, luminal and neuroendocrine cells (e.g. Blackwood, 2011, Gaisa, 2011). In contrast, there is some, but rather limited evidence for CARNs in human prostate. As such, the authors need to expand on these aspects in the present paper and discuss the possibility that the results in the paper may not be directly translated to the human system. As noted by the reviewer(s), CARNs are defined in the regressed prostate epithelium, and thus all of the in vivoexperiments involve manipulations performed following castration. We agree that this point should be clearly stated, and have added this caveat to the fifth paragraph of the Discussion. As discussed in the third and fourth paragraphs of the Discussion, there are several lines of evidence that CARNs differ from bulk luminal cells in the regressed prostate epithelium. However, as noted by the reviewer(s), the effect of AR deletion in CARNs on tumor formation following Pten inactivation could in principle be due to differences between CARNs and bulk luminal cells and/or differences due to Pten loss in the regressed versus hormonally-intact prostate epithelium. The suggested experiment using an inducible luminal cytokeratin Cre driver for Pten deletion in castrated versus intact mice might help distinguish these possibilities, but we believe that this experiment lies beyond the scope of the present study. However, we have revised the Discussion to explicitly discuss this caveat for our interpretation in the Discussion. In response to this comment, we have added new experimental data that directly compares the efficiency of AR+ and AR– CARNs in establishing 2-dimensional cell lines. In brief, we sorted 60 single YFP+ cells from castrated and tamoxifen-treated Nkx3.1CreERT2/+; Arflox/Y; R26RYFP/+ experimental mice into wells of a 96-well plate. We found that 6 cells gave rise to adherent lines, with 4 of these being AR+ lines that had failed to undergo Cre-mediated recombination, and 2 lines being AR– lines. After correcting for the observed 87.1% efficiency of recombination of the AR-floxed allele in vivo(Results, eighth paragraph), the relative efficiency for the AR– CARNs compared to AR+ CARNs is 7.4%. The decreased plating efficiency of AR– CARNs is also consistent with the tissue grafting data in Figure 3H. This experiment is now described in the Results section. We agree with the reviewers that our description of the focal neuroendocrine differentiation in the NPKA-CARN tumors was insufficiently detailed. As suggested by the reviewers, we have provided additional quantitation of the synaptophysin-positive cells in the NPKA-CARN tumors. These data are now presented for each individual tumor in Figure 6—source data 1, which shows that all three tumors contained synaptophysin-positive cells, but to varying degrees, resulting in the relatively large error bar in Figure 6F. We have also added panels in Figure 6E showing expression of additional neuroendocrine markers, corresponding to Foxa2 and Chromogranin A, which were observed in all three tumors, supporting the occurrence of focal neuroendocrine differentiation in NPKA-CARN tumors. Furthermore, we agree that the text in the Discussion was previously overstated, and have now edited the text to limit our claims to the occurrence of neuroendocrine transdifferentiation in NPKA-CARN tumors. We agree that discussion of epithelial progenitors and the potential existence of CARNs in the human prostate is relevant for the interpretation of our findings, and therefore have added a paragraph on this topic in the Discussion. While functional lineage-tracing approaches as performed in genetically-engineered mice are not feasible in human prostate in vivo, lineage-reconstruction studies by analysis of patterns of mitochondrial DNA mutations have yielded insights into potential lineage relationships. As mentioned by the reviewer(s), previous studies have indicated the existence of multipotent epithelial progenitors (Gaisa et al., 2011; Blackwood et al., 2011). Furthermore, recent analyses have provided evidence for multipotent basal progenitors localized to the most proximal region of the prostate as well as more distally located unipotent luminal progenitors (Moad et al.,). Notably, there is also evidence for bipotential luminal progenitors in ex vivostudies of human prostate organoids (Karthaus et al., 2014). Our revised manuscript also cites evidence for the existence of CARN-like cells in studies of human prostate tissue slice culture (Zhao et al.,2010) and prostate tumors (Germann et al.,2012). Thus, we believe that current data favor a general similarity of epithelial lineage relationships in the two species, suggesting that findings deduced from analyses of the mouse prostate may be translatable to the human prostate. These points are now discussed in the fifth paragraph of the Discussion. We thank Robert Cardiff for advice on histology and Cory Abate-Shen, Laura Crowley, Maximilian Marhold, Maho Shibata, and Roxanne Toivanen for insightful discussions and comments on the manuscript. Our studies used the CCTI Flow Cytometry Core (supported in part by the Office of the Director, National Institutes of Health under awards S10RR027050), and the HICCC Molecular Pathology Shared Resource. This work was supported by post-doctoral fellowships from the DOD Prostate Cancer Research Program (CWC, BIL), by a Rutgers SHP Dean’s Research Intramural grant (AM), and by grants from the Prostate Cancer Foundation (MMS) and the National Institutes of Health (MMS). Human subjects: Radical prostatectomy samples were obtained from consented patients under the auspices of an Institutional Review Board approved protocol AAAC4997 at Columbia University Medical Center. Animal experimentation: All animal experiments were performed under protocol AAAR9408, which was approved by the Institutional Animal Care and Use Committee at Columbia University Medical Center. © 2018, Chua et al.